At last, four of the five bank chiefs sacked three weeks ago by Central Bank of Nigeria (CBN) Governor Sanusi Lamido Sanusi over the huge non-performing loans of their banks have had their day in court. They were arraigned by the Economic and Financial Crimes Commission (EFCC) Monday before a Federal High Court sitting in Lagos. The four ex-bank chiefs arraigned on five separate charges of 131 counts bordering on fraud, concealment and grant of loans without adequate collateral running into about N625.95 billion were former Chief Executive Officers of Oceanic International Bank, Mrs. Cecilia Ibru; FinBank Nigeria Plc, Mr. Okey Nwosu; Afribank Plc, Mr. Sebastian Adigwe and Union Bank of Nigeria, Bartholomew Ebong. Nwosu, Adigwe and Ebong have been in EFCC's custody for about two weeks now while Ibru only turned herself in to the anti-graft commission last week. The fifth bank chief, the CEO of Intercontinental Bank, Chief Erastus Akingbola, remains at large. Also arraigned yesterday were seven non-executive directors of Intercontinental Bank Plc including the Chairman, Chief Raymond Obieri, Hyacinth Enuha, Christopher Adebayo Alabi, Samuel Adegbite, Isyaku Umar, Bayo Dada and Sanni Adams. Others were three bank debtors, Mr. Peter Ololo, who was arraigned alongside his company, Falcon Securities Limited, and Henry Onyemem and Niyi Opeodu who were arraigned with Ebong. Nwosu was the first to be arraigned on a total of 11 charges. He was accused of failing to take all reasonable steps to ensure the correctness of FinBank monthly bank return to the CBN between October 2008 and May 2009. He was also accused of failing to give true and fair view of the state of the affairs of the bank to CBN by incorrectly importing N47.6 billion of commercial papers under the Expanded Discount Window in FinBank's statement of assets and liability. According to EFCC, the offences are contrary to and punishable under Sections 28 (3) and 50 of the Banks and Other Financial Institutions Act (BOFIA) CAP B3, Laws of Nigeria, 2004. The next to be put in the dock were Sebastian Adigwe; former MD of Africabank Plc, Mr Peter Ololo; and his company, Falcon Securities Ltd.
Adigwe was accused of granting loans of about N91 billion to Falcon Securities Ltd, Rehobet Assets Ltd, Kolvey Company Ltd and many others without adequate collateral contrary to the provisions of Failed Bank (Recovery of Debts) and Financial Malpractices in Bank Act, Cap F2 Laws of the Federation of Nigeria, 2004 and other offences punishable under the same law. Other charges levelled against Adigwe were that he failed to keep proper books of accounts and classification of commercial papers as contingent liabilities of his bank. He was also accused of failing to take reasonable steps to ensure the correctness of the bank's monthly return to CBN from October 2008 to May 2009. The seven non-executive directors and members of Board of Directors of Intercontinental Bank, who were the third set to be arraigned on 18 count charges, were accused of colluding with the former managing director, Akingbola (now at large), to grant various credit running into over N36 billion to companies, in which they are also directors without security. They were also accused of taking $10,000 as holiday allowance in contravention of the code of conduct for banks issued by CBN. The bank directors were further accused of ensuring that the balance sheet of Intercontinental Bank did not give a true and fair view of the state of affairs of the bank with regards to the non-performing credit amounting to N87.6 billion. For these, they were said to have committed an offence contrary to Section 28 (1) (2) of the Banks and Other Financial Institutions Act Cap B3 and Cap F2, Laws of the Federation, 2004 and punishable under Section 28 (3) (A) of the same Act. Ibru, who was arraigned on a 25-count charge, was accused of granting bad loans running into over N12 billion. Specifically, she was accused of granting a non-performing loan to seven companies and to one Ibru Edesiri Onateji without security contrary to the Bank's regulations. She was also accused of granting over N25.5 billion without the approval of the apex bank contrary to the laid down procedures and thereby committing offence contrary to provisions of Failed Bank (Recovery of Debts) and Financial Malpractices in Bank Act, Cap F2 Laws of the Federation of Nigeria, 2004. The last to be arraigned were Ebong of Union Bank and Henry Onyemem and Niyi Opeodu whose identities were not disclosed. Ebong's major offence was that he allegedly granted loans of over N150 billion to several companies without collateral thereby committing offence contrary to provisions of Failed Bank (Recovery of Debts) and Financial Malpractices in Bank Act, Cap F2 Laws of the Federation of Nigeria, 2004. However, the former CEO of Intercontinental Bank, Akingbola, could not be arraigned alongside others as he was said to be at large. After hearing the allegations against them, all the bank executives pleaded not guilty. 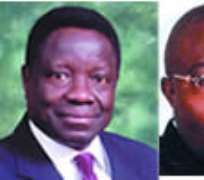 Frantic efforts made by their lawyers, who included Chief Wole Olanipekun (SAN), Prof. Gabriel Olawoyin (SAN), Niyi Akintola (SAN) and Peter Jimoh-Lasisi (SAN), to secure their bail proved abortive as the presiding Judge, Justice Dan Abutu, ordered them to file formal applications for bail before the court. The position of the court was sequel to the objection raised by the prosecuting counsel, Rotimi Jacobs, who argued that counsel must file written addresses so as to enable parties to put enough materials before the court. Abutu consequently ordered Nwosu, Adigwe and Ololo to be remanded in Ikoyi Prison, while Ibru and the seven directors of Intercontinental Bank were ordered to be remanded in EFCC custody. The matter has been adjourned till September 4 for hearing of the bail applications.